Talk about déjà vu all over again, it is horrifyingly clear that the lying deceitful Judases selling us this crock-of-excrement bill know border security “ain't happenin'” this time around, either. As I stated, government lied about securing the border in 1986 and they are lying about securing it again. The betrayal by our Republican leaders of you good folks, decent hard working Americans truly angers and sickens me. Judas sold-out Jesus for thirty pieces of silver, Esau sold his birthright for a bowl of beans and many political leaders who pledged loyalty to the Tea Party (We The People) have sold us out for frivolous rewards in DC. I am talking high school nonsense such as a desire to be liked by certain powerful people, praise from the mainstream media and invites to “A” list Washington DC parties. Yes folks, their reasons for betraying us are just that simple, absurd and disgusting. Remember the passion you felt fighting Obama-care? That passion must be rekindled to fight the Amnesty Bill. Republicans have proven that they can not be trusted to do right by us or the country. Thus, they must be forced to do the right thing – to say “H--- No!” to this insanity. During his interview on Rush's radio show, Ted Cruz explained why the Amnesty Bill is a disaster, why it is amnesty and why it must be stopped. And by the way, thank God for freshman Senator Ted Cruz. Cruz is one of us folks, a real-deal America lovin' Conservative with character and backbone. Break out your American flags and home-made signs. Singers and songwriters start freshening up your vocal chops. Speakers start fine tuning your speeches. 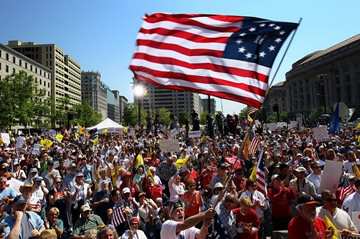 It is time to Tea Party across America again. If we do not peacefully, but firmly, raise holy h--- and amnesty is passed, America as we know and love it is over. Patriots, we have fought too long and hard to lose our country. See y'all at the rallies!